Whether you’re a hardware vendor, a software developer or an end user, RFolution! solves the problems of wireless RF data collection systems for those using PC networks. RFolution! is a product of ASP Microcomputers of Melbourne, Australia. ASP has been established 40 years (since 1977), and we are highly skilled in the design, manufacture and distribution of Automatic Data Capture products using technologies such as barcode, smartcard, magnetic stripe and iButton. ASP is endorsed as a supplier by the Australian Government, and a Quality Certified Company. You’ll find ASP’s main web site at www.asp.com.au. This site is focused on explaining RFolution! and how simple it can be to create a high performance RF Barcode Reader Network. Take me through the “create and test” stage. RF barcode readers communicate using the TCP/IP protocol. RFolution! takes care of all the complexities of this protocol, communicating to multiple readers, while letting you or your programmers concentrate on writing straightforward programs using VBScript. (If you know Visual Basic, you know VBScript). RFolution! adds a number of special functions to standard VBScript to make your task even easier. These programs actually run on your PC, and talk at high speed to a small driver program (technically called a “Thin Client”) installed in your RF Portable Barcode Reader. This driver gives the VBScript program control of the Barcode Reader, without the overheads associated with old fashioned screen remapping. We include programming examples and a detailed Manual on the RFolution! CDROM. Program examples include a stocktake program that creates a PC file (like a batch terminal might), a program that interacts with a database and a Microsoft Excel spreadsheet to build an Invoice on the screen of a PC in real time as the barcode reader scans, and even a “guessing game” to demonstrate terminals talking automatically to each other! We’ll be adding more from time to time and advising of these in our RFolution! Newsletter. If the program is running on the PC, is the application portable to different brands of RF Portable Barcode Readers? Yes, provided we have a Virtual RF Simulator (see below) for each brand of reader. You may also need to make minor program modifications if the screen sizes of the readers are different. But the bottom line is much more flexibility, and no need to buy extra development languages. If you have already developed applications with drivers built directly into your source code (one of the time consuming and expensive other methods we referred to at the start), this flexibility is a compelling reason to change now to the “RFolution! Way” (and probably why you have taken the time to read this information). What about testing, you said I don’t need RF gear, how can this be? RFolution! includes a photorealistic simulation of the target Barcode Reader that actually runs on your PC. We call these Simulators “Virtual RF” because they are complete TCP/IP protocol terminals, that work just like the actual terminal. Click with your mouse on a key, and it’s as though you pushed the key of an actual terminal. If your program works on our Virtual RF Terminal, you can be confident it will also work on the real thing. Can I demonstrate an application without RF equipment? Yes, you could, and our low price for a Virtual RF only version of RFolution! makes this an extremely attractive development and testing environment, AND sales tool. Imagine for instance that your client had a Virtual RF version of RFolution!. Then you email your VBScript program for instant demonstration or testing. What about accessing my Windows databases? VBScript gives you full access to Microsoft interoperability standards such as ADO and ODBC. This ties in well with the modern trend of software suppliers documenting open database standards to accommodate third party software. Our sample programs show how simply complex things can be done. You don’t have the complexity of trying to build drivers into existing programs (which is impossible anyway if you don’t have source code). As an example, ASP recently added RF functionality to its own stock program (an Access Database) WITHOUT touching the stock program code, and in just over ONE HOUR of programming! We simply modified the sample invoice program we have included with RFolution! If your needs are complex, ASP offers an international programming service to help you. What about Site Surveys, I thought they were complicated? The point of a Site Survey is to establish reliable access zones for your RF Access Points (wired into your PC network), and the roving RF Portable Barcode Readers. This takes into account distances, building structure etc. 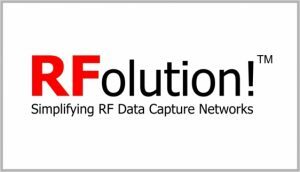 While formal Site Surveys may still be required in some instances, many of the RF networks to be established by users of RFolution! are relatively simple. So we supply a VBScript program to give you an easy to use Site Survey capability. Just wander the intended area with your RF Portable Barcode Reader, and network performance will be displayed on screen based on reports from RFolution!. Then note the results on a building plan. By experimenting, this will guide you on the number and location of Access Points and appropriate antennas. How do we “deploy” with RFolution! The various VBScript applications available to your new RF network are simply selected and allocated on the RFolution! control panel. You can restrict access from specific terminals, or by specific users, and RFolution! maintains an ongoing Activity Log when you need to see what has been happening. You can even set a Debugging Trace to check program operation. RFolution! can be minimised and will still operate your RF network. The PC running RFolution! doesn’t need to be close to the actual RF terminals. Multiple RF Access Points can be used to cover larger areas, with RF portables roaming seamlessly across zones (provided they are on the same Router). How do I choose an RF portable? Extra terminals are being added progressively. Creating a Virtual RF Simulator for MS-DOS, DRDOS and Windows CE devices is straightforward as we port our existing code to the new device, and link this to a functional image of the target. While this is not a trivial task, it is not unduly time consuming, so if you have a favourite terminal, email us for advice on time to availability, we might be able to bring it up in the queue. And don’t forget you can change your RF hardware at any time, because RFolution! gives you hardware independence. Sure you might need to make some minor program changes relating to screen displays, but think of the flexibility! You can also intermix different types of RF hardware, so you’re not locked in to one brand when you need to expand your network. All this sounds very simple and logical, what’s the catch? There really isn’t one. We called our product RFolution! because that’s just what it is. A revolution in the creation and deployment of RF data capture systems. Bringing simplicity to that which was complex. Trying RFolution! will prove the point. What about your programming services? We also offer programming services from our own in-house programmers. Naturally we’re fast and efficient because we know our product inside out, and have 40 years experience of business needs. We can produce complete applications, or just help you through the hard parts. Our services are naturally confidential, and suitable for use by dealers. You’ll find our documentation and examples straightforward and complete. We provide FREE support by email or telephone for the first couple of weeks after purchase to get you going. Support is then handled on a very reasonable charged casual basis unless you would prefer an annual contract. If you need more training, we’ll be happy to structure a targeted course to meet your needs. What do your clients think of ASP? ASP Microcomputers is an ethical and highly skilled company that has been solving client problems for 40 years. We are an Endorsed Supplier to the Australian Government. You’ll find lots of other Testimonials on our “testimonials” page.